It is a strange situation in my home state of Texas. The Lone Star State is pretty solidly red, and being from West Texas I am more representative of what people think of as "Texan": stoic, self-reliant, rugged, individualistic, with a hint of swagger (minus guns, which I don't own and have never liked). For the record, I HAVE ridden a horse, though only twice. HOWEVER, there are certain islands in Texas that are further to the left of San Francisco. The wackiest Texas city happens to be our state capital. 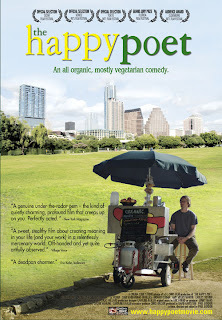 In Bernie, the area was described as "The People's Republic of Austin", and The Happy Poet is reflective of the part of the state which makes it look like it was Portlandia with a Texan accent. Their motto is "Keep Austin Weird," and the denizens of The Happy Poet fit into what I imagine a typical Austinite would be: eco-friendly, in need of 'medicinal marijuana', a trifle clueless, but at heart decent and well-meaning. It reminds of another line from The Golden Girls when Sofia tells Rose, "Your heart's in the right place but I don't know where your brain is." The Happy Poet neither ridicules or elevates the oddball idealism of the main character. Instead, the deadpan humor (while not to everyone's taste) chronicles a surprisingly lifelike, sweet tale of one man's quest to live up to his principles and who despite his own elitism, manages to make a success of it. Bill (writer/director Paul Gordon) has a dream: to open up a vegetarian food stand whose products are locally and organically grown. He has to cover up the hot dog image in front of the hot dog stand he is paying off month by month because, well, he isn't selling hot dogs. Try some tofu or nuts. His lack of money does not dissuade him from his dreams, so with the little money he does have (including a $750 loan from the bank, which tells him flat-out, "With your debts, your lack of experience, and quite frankly your elitist attitude I don't even feel comfortable even approving a loan at all"), Bill charges full-steam ahead. Given it is Austin (center of the bizarre), his stand starts gaining a following. 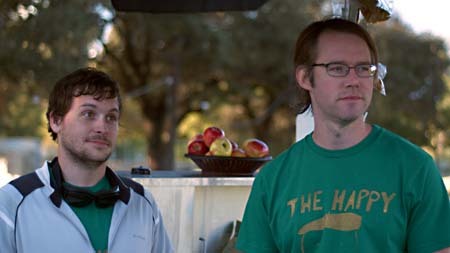 He gets help from two people: Curtis (Chris Doubek) a homeless man who was his food's first fan, and Donnie (Jonny Mars), last of promotions who has eagerly taken on the task of delivering his food and passing out flyers. Among Bill's growing clientele is Agnes (Liz Fisher), in whom Bill takes an interest in and which is mutual. Donnie arranges a double date, and she is intrigued to hear his poetry (Bill having an English degree in poetry I believe). This line of work also inspires the food stand's name, The Happy Poet (though truth be told Bill rarely shows any emotion, let alone happiness). Eventually, Bill realizes that capitalism can be a tough business, and also discovers that Donnie, along with delivering his food, also has been delivering something else, more 'medicinal', if one gets my drift. Bill is very upset about this, and nothing Donnie does appeases Bill (who doesn't smoke and has always been on the level). However, with one or two twists we see that eight months later The Happy Poet not only is resurrected but has franchised. The Happy Poet is a remarkably sweet story about someone who lives and works by his principles. Granted, there is something almost smug about Bill (his genuine incomprehension as to how people would want 'hot dogs' when they could have vegetarian food) but on the whole we see that Bill means well. One admires his tenacity while chuckling at his cluelessness. It is a deliberately quirky little film, keeping a balance between holding up the characters to ridicule or holding them up for admiration. I admire that Gordon kept Bill as this flat but well-meaning character, one who speaks throughout in a monotone that also seemed completely believable. Doubek and Mars were equally delightful as the homeless man with a big secret and the cool guy who delivers more than food. Here we see that like Bill, they also mean well and at heart are nice people, though whether or not they are logical remains to be seen. If there is anything I found grating in The Happy Poet is the score, which punctuates its comedy with one piano note playing whenever the scene is over. I will warn people that The Happy Poet is a very deadpan film, with a droll sense of humor that will not be to everyone's taste. On the whole, however, The Happy Poet will satisfy those who enjoy offbeat, self-consciously quirky humor. Paul Gordon is a talent on the rise, and The Happy Poet should make for an excellent calling card. Keep Austin Weird, my man.